Crushes are good for you, say netmums in their recent post. 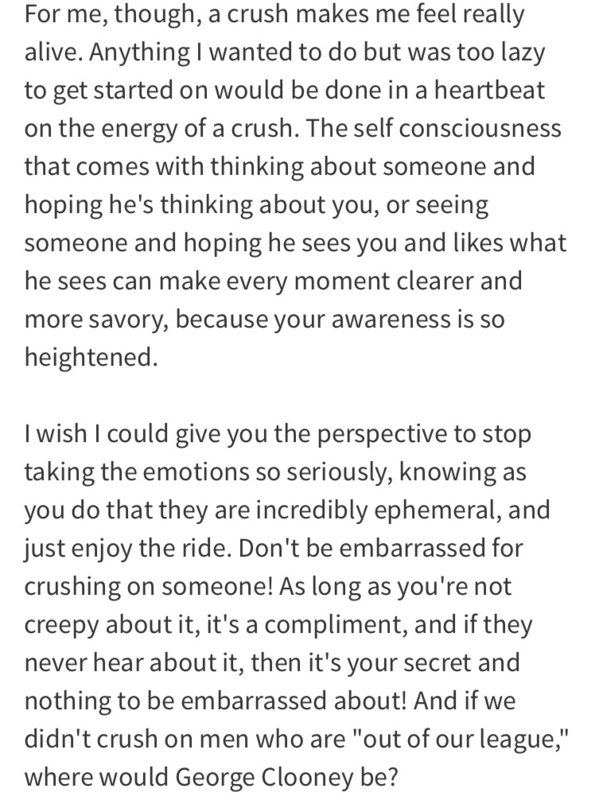 I think the type of crush they are referring to is a fleeting sort with a stranger passing through someone’s life. Or somebody like a celebrity. I get it. These ones are indeed alright. The ones I am writing about are intense, full on, obsessive types where a person is in your life for a period of time and you end up building a world around him or her that only and solely exists in your head. The person in question usually does not even know about your secret crush. You know they are unavailable or that they will never reciprocate. Yet, you fall under the spell and you crush hard. The fact that this fantasy exists only in your head does not diminish the heartbreak. It is madness. Gladly, I believe that most people would probably have no problem getting over a crush of any type. Some do get stuck however, including myself. Crushes must have a silver lining. We must be able to reframe our view on crushes. We must be able to heal ourselves by changing the attitude and the perspective. I wish I could complete my extremely scientific research with a link to a wonderful article I found on wikihow a while ago, on how to get over a crush, however it does not seem to exist anymore. Two pieces of advice in that article rather entertained me – one was to start believing in God and go to church, another – to join the army. Radical to say the least! I hope I can evolve myself into changing my relationship with and attitude to crushes. In the meantime, here is my view on crush lifecycle which looks very similar to grieving stages, and a poetic-slash-philosophical perspective. Here’s to moving down the lifecycle as soon as possible, or not even getting a crush in the first place! 7. Plan a life. Have a life. Can crushes be our guardian angels, a kiss from the universe, a fleeting embrace that we read too much into? Instead of enjoying the moment and admiring it like a beautiful butterfly which has landed on our palm, then letting it go, we cling to it for dear life, denying transience of the moment, grasping to its impermanence, in our desperate search for immortal? This entry was posted in philosophical, self and tagged crush, happiness, love, nomad, obsession, universe. Bookmark the permalink.